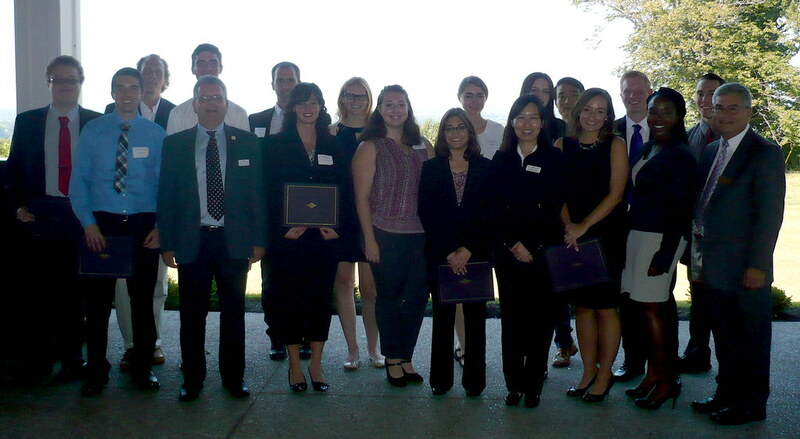 Since 1975, Niagara University College of Business Administration has held the Everett W. Ockerman Lecture and Award Presentation to recognize the business seniors who have achieved a 3.5 (and above) overall grade point average. This year, on Sunday, Sept. 24, at the Niagara Falls Country Club, over 50 business seniors were recognized for their academic achievements. The awards ceremony is named after Dr. Ockerman, a faculty member for 30 years at Niagara who served as chair of the department of commerce for 25 years. He retired in 1975, but continues to have an impact on current Niagara students. Dr. Ockerman generously provided the university funds for the Ockerman Scholarship and for an annual event to recognize graduating seniors for their hard work in achieving academic excellence. Dr. Christopher Wright, associate professor of management and chair of the management department, served as the emcee for the event. Dr. Jim Kling, associate professor of management, provided the invocation, reminding those in attendance that perseverance and hard work have led them here, and that God’s grace has provided this celebration. Gerald Janan, ’58, shared his recollections of his former professor, Dr. Ockerman, in his talk, “Remembering Doc Ock.’ He shared his story of growing up in Father Baker’s orphanage and meeting Dr. Ockerman at Bishop Timon High School, where he was recruiting for Niagara’s cross country and track team. Faculty from the four business departments presented certificates to the students. Dr. Tenpao Lee, interim dean, provided the dean’s remarks recognizing Dr. Ockerman’s commitment to the university and encouraging the students to continue to give back. This day of recognition allows for the celebration of academic achievement with students, faculty, friends and family, and to remember a person who has made a difference in the lives of Niagara University students.